Supermarket brand champagnes raked in gold medals across the board at the International Wine Challenge awards earlier this year, beating posh bubbly like the £135 Cuvee Amour De Deutz (2005) from Champagne Deutz. 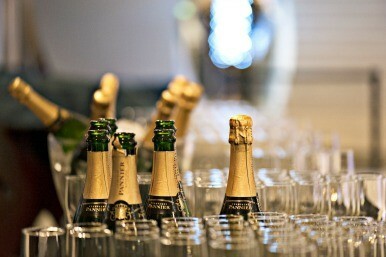 In fact seven supermarket champagne won gold medals, with three costing under £20 per bottle. Marks and Spencer Herbert Beaufort NV (£32.00). What makes a good champagne? The AOL Money team decided to find out what all the fuss was about and asked champagne connoisseur and writer Richard Juhlin what makes a good champagne. "For me, a champagne educated and demanding man, I look for other things. Such as balance, elegance, depth and aromatic complexity. "My favourites can represent different styles but thus criteria mentioned should always be fulfilled. It can be flowery, fruity, gamey, toasted, light or full-bodied, but always reflecting the chalky terroir and have a balanced, elegant and multi-dimensional taste." With this in mind the team at AOL Money decided to put the gold medal-winning supermarket champagnes to the test to pick a winner from the best of the bunch. Find out which budget champagne took the top spot below. "Nice taste but not enough fizz." "It's harsh at the back of the throat." "This one's rather flat for me." The Sainsbury's Taste the Difference might have been one of the priciest bottles of supermarket champagne but the tasters picked up on how quickly it went flat and scored it the same as the other bottle from Sainsbury's at 2/5. "Oohh it's like drinking the stars." "It has a lovely crisp, dryness." "Well balanced, I could drink more of this." This champagne had the tasters waxing lyrical and even going on to jokingly quote the forefather of chamagne, Dom Pérignon - "Come quickly, I am drinking the stars!" was falsely attributed to the monk in the late 19th century. They even tried to come back for more after scoring it a near-perfect 4.5/5. "This is tart without being harsh." "This is the most distinctive and bold." The Asda extra special might have been the cheapest bottle on trial but it packed the biggest flavour punch, scoring highly with the testers on aroma and depth putting it in second place with an average mark of 4/5. "Very smooth and slightly creamy." Co-op's second offering was well received with all of the tasters praising its rich flavour notes and texture. Co-op's cheaper bottle scored highly enough to secure third place with an average mark of 3.5/5. "Easy to drink and the most citrusy of the bunch." "A bit too gassy - burping isn't great for a dinner party!" "Pungent smelling and a bit harsh." "Fruity with very little acidity and quite well balanced." "It's overpowering, I couldn't drink a lot of it." Before the labels were hidden the tasters were the most excited to get stuck into this bottle from Marks and Spencer. Despite being the most expensive bottle in the trial, it only scored an average of 2.5/5 putting it in third place. "It's not crisp at all, or fizzy enough." "It's light, almost too light in fact." "It tastes like cava to me." This offering from Sainsbury's fell flat with our tasters, literally. All the testers commented on the lack of fizz and depth leaving the Blanc de Noirs with an average score of 2/5 and in jint bottom place.